"....A 2017 surveyfound that 42 percent of community-college students nationally experienced food insecurity within the past month—which could mean missing meals altogether or not being able to afford balanced meals—while 12 percent were considered homeless at some point in the previous year...."
"....What separates Amarillo College from most of its peers is not any particular program, but how much it focuses on addressing the effects of poverty. The school and Lowery-Hart are being watched by college leaders all over the country, because finding realistic solutions for student poverty could be transformative for the U.S. higher-education system...."
Application deadline January 26, 2018. Thanks to Chapter Member Jason Tsai for passing this on. Jason writes: Application deadline has been extended to this Friday! I count my fellowship time as one of the most significant formative experiences thus far in my life. Not to mention the lifelong friends and skills I gained along the way. If you have any questions, I'd be happy to chat with you! Tricycle’s Urban Agriculture Fellowship and Certificate program is the first program of its kind designed in partnership with the USDA- Natural Resources Conservation Service. Urban Ag fellows dig in with Tricycle staff, subject matter experts from USDA, VA Tech, Rodale Institute, Roots of Success, Small Business Association and others for an 11-month term that provides formal instruction and hands-on experiences grounded in the business of sustainable urban agriculture. "Small steps can create big changes in your community’s food quality and food security, helping to get more healthy food to more people and support a better food system. Ali Berlow shows you dozens of things that anyone can do, from creating a neighborhood kitchen for preserving fresh food to mapping farmland, connecting food pantries with food producers, starting a school garden, and organizing a community composting initiative. Every action you take can help keep farmers on the land and family farms intact, keep money in the local economy, reduce the carbon footprint associated with food transportation, and preserve local landscapes. If you’ve had enough of E. coli scares, disappearing farmland, pesticide problems, and hunger in your community, this inspiring book will show you exactly how one person really can make a difference." "One person really can make a difference. From starting neighborhood kitchens to connecting food pantries with local family farms, Ali Berlow offers a variety of simple and practical strategies for improving your community’s food quality and security. Learn how your actions can keep money in the local economy, reduce the carbon footprint associated with food transportation, and preserve local landscapes. The Food Activist Handbook gives you the know-how and inspiration to create a better world, one meal at a time." 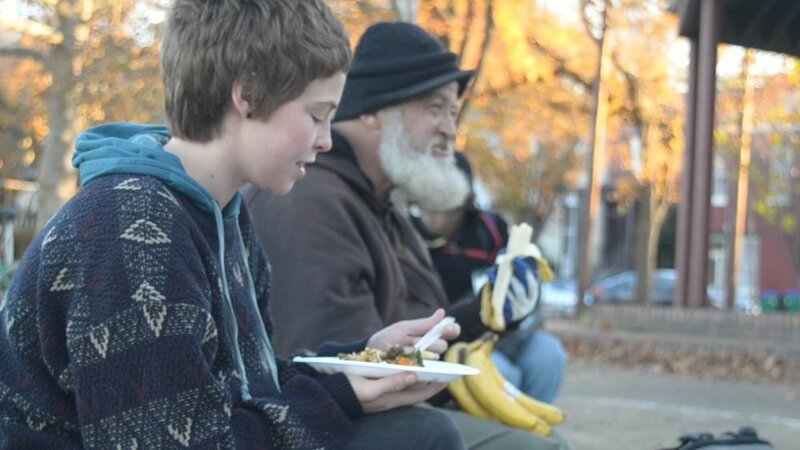 Food Not Bombs is a loose international affiliation of groups which are dedicated to sharing food and resisting militarism and helping end homelessness. This is the Richmond, Virginia chapter. From NPR: In Some Rural Counties, Hunger Is Rising, But Food Donations Aren't: Please Donate in Virginia! "One in eight Americans — 42 million people — still struggles to get enough to eat. And while that number has been going down recently, hunger appears to be getting worse in some economically distressed areas, especially in rural communities. Food banks that serve these areas are also feeling the squeeze, as surplus food supplies dwindle but the lines of people seeking help remain long...."
Read the whole story here about the need for food donations to Virginia food banks. "By leveraging partnerships with business, faith-based groups, nonprofits and other community-centric organizations, we are able to positively, and significantly, impact neighbors who face hunger across 34 counties and cities in Central Virginia. distributed more than 22.9 million meals through our network of partner agencies and programs. provided a snack and/or hot, healthy evening meal to more than 3,900 children each weekday through our Kids Cafe program. distributed more than 918,000 meals to nearly 4,000 individuals who live in underserved communities with our Mobile Pantry. volunteers delivered more than 344,700 fresh and emergency meals to 1,636 homebound seniors and disabled neighbors in our Meals on Wheels program. distributed more than 59,200 BackPacks filled with healthy, easy-to-prepare meals to 1,852 students across our region. made a difference in the lives of the nearly 200,000 children, families and seniors who struggle with hunger."